Host Natalie Morales from the Today Show wiped Al Roker's weather wall, as well as a camera and teleprompter with a cotton swab back in October. But just what did she and her co-host Willie Geist expect to find? They were citizen scientists looking for microbes—the tiny invisible, bacteria, viruses and fungi that may live on the sampled surfaces. Once captured, these televised swabs joined the Project MERCCURI collection that includes samples from museums, historical monuments and sporting venues. This massive "crowdsourced" gathering effort's full name is Microbial Ecology Research Combining Citizen and University Researchers on the International Space Station, which references its mission to send the litany of microbes to the space station for research. "The whole goal of this project was to be a citizen science project and to engage the public as much as possible," said David Coil, Ph.D. and co-investigator. "It was designed with public collection in mind. We collected from a few really cool venues including Sue the T. Rex at the Field Museum in Chicago, the Today Show, the Liberty Bell, and several NFL/NBA stadiums. We have received an extremely enthusiastic response from people. There has been a lot of interest at these public venues in helping us collect samples which has been great." The project is a partnership with microBEnet, ScienceCheerleaders, Space Florida, NanoRacks, NASA, and SciStarter.com. The samples are scheduled to launch aboard the SpaceX-3 mission in March 2014. Once aboard, operations begin within a few days of docking and will run for nine days in the microgravity environment. Before being stowed to ship home with the returning Dragon spacecraft, the station crew will add their own samples to the collection by swabbing the surfaces of the orbiting laboratory. 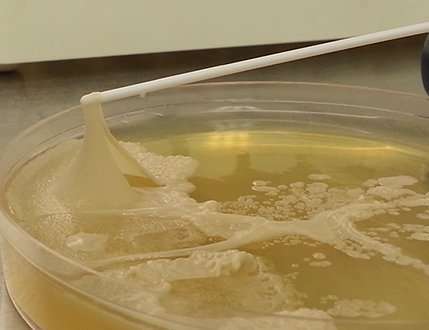 This will allow researchers on the ground at the University of California, Davis, to use the station swabs to see what kind of microbes are living aboard the laboratory. "The very nature of the question is 'what effect does microgravity have on these organisms?' so the space station is pretty much the only option," said Coil. "The hope is that studies like this will be of use to future long-term manned space missions where people and their microbes will be sealed in together for a long time." Microbes can be good or bad, providing much needed nutrients to the environment or leading to dangerous infections. Scientists at UC Davis transferred the swabs' samples to Petri dishes, incubating them to see which would grow into colonies. Researchers identified hundreds of bacteria from the public collections, selecting 48 to send into space. "My favorite sample is probably the unknown species that was collected by some youth cheerleaders in San Diego," said Coil. "One of the bacteria we grew up from that sample appears to be a whole new genus and species which we're in the process of describing...and of course that bacteria will be on this mission [to the space station]." The project makes use of the NanoRacks Plate Reader facility during operations aboard the space station. This facility allows researchers to compare the growth of the samples in space and on the ground simultaneously. Once aboard the station, these colonies will grow in the microgravity environment of space, which may help lead to a better understanding of the nature of the bacteria. 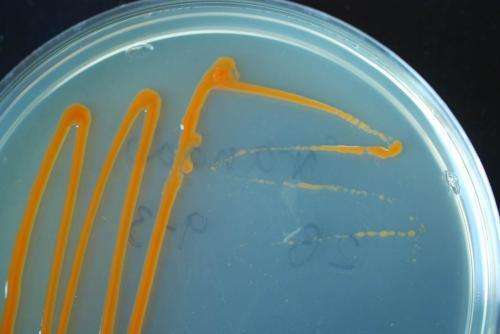 "Scientifically, it's important to know how various microbes behave in space, before sealing people and their microbes up for a long time and sending them off to Mars," said Coil. "The swabs from the space station will be analyzed for a simple understanding of what is living there. The 'microbial playoffs' with the 48 bacteria is to ask the question 'how does the growth of these bacteria differ between microgravity and on Earth.' We will run a duplicate of the station experiments on the ground at the same time in order to help answer this question." Meanwhile, those who submitted samples have had the rare experience of participating in a space station investigation. This interaction raises interest in research from all walks of life, while providing test samples from those varied paths. According to Coil, the civilian scientists can learn more about the various bacteria they and others helped to collect, such as where the microbe was found, why it's "awesome" and other fun facts. Those who want to keep up with the study in real time can follow the hashtag #spacemicrobes on social media. "Each microbe has a 'trading card' that you can view on our website," said Coil. "These cards describe where the bacteria was collected, how well it grows, some interesting facts about the bacteria, etc. We grew up hundreds of bacteria from the various events around the country, these were chosen on the basis of not being pathogens—a NASA requirement for the study—and ability to grow under the conditions we're using." The study may advance future biological and pharmaceutical microgravity research, which could help scientists better understand bacteria and improve treatments for afflictions caused by various pathogens. Knowing more about the nature of bacteria can assist researchers as they work to determine the effectiveness of medicines and explore cellular pathways for targeted disease therapies. To Coil, however, the importance of this project is that participants are learning in a unique way about bacteria and the space station. "The biggest direct benefit of this work is to raise awareness about microbes, particularly about microbes in the built environment," said Coil. "We've also worked really hard to convey our basic message of 'microbes are everywhere and most of them are not bad,' and people have been very responsive to that. Already we have reached hundreds of people who might not otherwise have though much about either of these topics—or the space station for that matter."